On August 16th, 2018, the Queen of Soul passed away at her home in Detroit, Michigan, after a battle with pancreatic cancer. Aretha Franklin was 76 years old. Tributes from around the world poured in — political leaders, musical icons and everyday people reflected on her unmistakable sound, social activism and command of seven letters: R-E-S-P-E-C-T! Simmons recounted a story from the early-1980s when he was with Diana Ross and pitching a duet between the two legendary performers. Simmons continued, “I will tell you from my hand to God — the graciousness and the kindness and the relatability — there was no airs about her.” Sadly, the duet never happened. But Simmons admiration for the Queen of Soul grew exponentially from the experience. A young Simmons, born Chaim Witz in Haifa, Israel, came to the United States when he was eight years old. He was in high school when he first heard Aretha Franklin’s version of “R-E-S-P-E-C-T” and he was forever changed. “As a kid coming from Israel, I didn’t know anything. I’d never heard of gospel or church music and I was just getting used to this rock and roll thing… Chuck Berry and Little Richard and all that. In fact, I did the eulogy for Chuck Berry when he sadly passed away. So I was in love with this music. “And, all of a sudden, she starts strutting out there with her back up there, this proud thing. And this voice came out. And I go, ‘What is that?’ You know, you stop what you’re doing. All of a sudden, you’re just taking by the incredible presence. 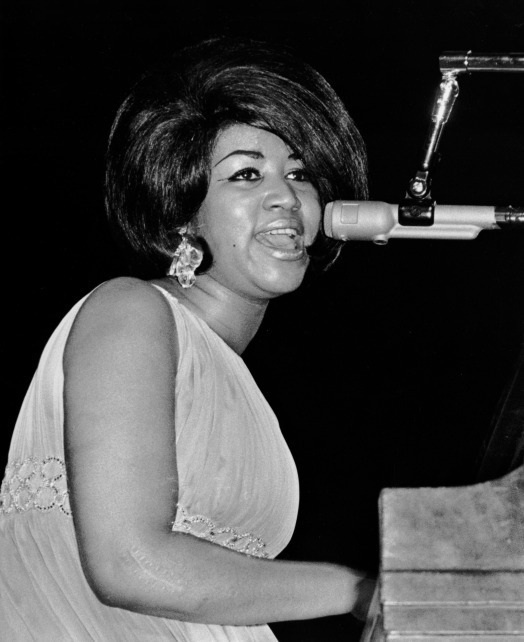 Simmons contend that Aretha Franklin was in a league of her own. “Beyond anything else. I’ve met lots of people of note — presidents and the Dalai Lama — there is such a thing as in the presence of greatness. “I would urge anyone who does YouTube videos, there’s a telling moment when the Godfather of Soul James Brown is doing a duet with Aretha Franklin. James Brown and Aretha are going at it. First it’s James singing, then, Aretha opens up and starts singing. James Brown is looking around and he drops to his knees and starts worshipping at the shrine.